As some of you may know, I love baseball. As a youngster I lived for this time of the year. I was a terrible player. I discovered very early in life that I would never become the next Roberto Clemente, so I did the next best thing. I would buy every baseball or sports magazine there was to learn as much as I could not only about my favorite team, the Pittsburgh Pirates, but also about the rest of the teams in the National League. I would eat, drink and sleep statistics – batting averages, home runs, RBI’s, earned run averages, and pitcher’s won-lost records. I read about the players’ personal lives, their families, their hobbies and other interests. In short, I had an interest and a curiosity that bordered on obsession. Those of you who follow the Cleveland Indians are very well aware that they have a new manager who has two World Series rings to his credit. The teams has been improved with free agents. For the first time since he bought the club, the owner has opened his pocketbook and is actually paying competitive salaries for proven talent. At least for the first few games, that investment seems to be paying off. The home opener was this week and for the first time in recent memory, there was an enthusiasm and an atmosphere of expectation that perhaps this team and this town can once again experience the excitement that was felt in the late nineties when winning the division was almost routine. This post is not about baseball. I merely wanted to draw you in a bit. 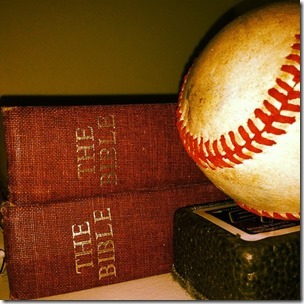 However, in many ways we can make a direct comparison and contrast between baseball and faith. The anticipation of winning that World Series championship comes around each spring with remarkable regularity. This hope that a new season brings is never destroyed, no matter how many disappointments we live through year after year after year. Those frustrations that we feel when the Indians disillusion us, had to be in many ways the same way the disciples felt just after Jesus’ crucifixion. This was the man they’d pinned their hopes on, the man who was going to take them to the World Series, metaphorically speaking, of course. He was going to return the kingdom of Israel back to the Jews and drive out the Roman invaders. But now he was dead, killed like a common criminal, on a cross. And then, our Gospel goes on to say, the disciples rejoiced when they saw the Lord. Try to imagine that scene, if you will. The disciples, once cowering in fear, upon seeing Jesus, in an instant celebrating, cheering, high-fiving each other with all the euphoria that comes from watching a star slugger hit a walk-off home run in the bottom of the ninth. Here is a new beginning. The Spirit, the helper, will help the disciples lay the claim of Jesus before people. And seeing Jesus and receiving the Holy Spirit made all the difference in their lives. The apostles were now speaking of grace and hope. They were the people of a new way. Their agenda remained the agenda of Jesus. But now the Spirit, as it inspired and empowered Jesus to bring goodness and hope to people, released the apostles from the powers that oppressed them, the power of fear, the power of sin, and showed them the way of peace. What about us? We who, like Thomas, were not there in that locked room on that first night of Easter. What difference does Jesus and the power of the Spirit make in our lives? We, too, are messengers of God’s salvation. We are a faith community that is called to be a people shaped by Jesus’ gift of the Spirit given to us in Holy Baptism. It is about a new beginning, a second chance to change direction (repentance) and to look to Jesus for leadership. It is also a chance therefore to find forgiveness for sins. To spread a message of forgiveness, Jesus doesn’t call those who appear blameless or somehow most worthy. He calls those who truly know that they themselves have been forgiven. Let us rejoice in the new beginning, the new season of Easter, the season filled with grace and hope. Jesus is calling us, forgiving us, and sending us.